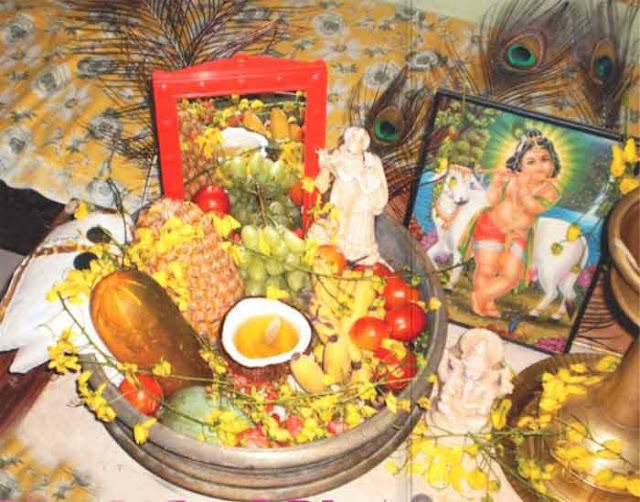 Vishukani, or Vishukkani, is an assortment of auspicious things that is viewed when one opens one’s eyes on the day of Vishu festival. ‘Kani’ means ‘that which is seen first.’ And Vishukani, that which is seen first on Vishu, is an indispensable part of this Kerala festival. Vishu is the Zodiac New Year in Kerala. The list of auspicious items varies from region to region and most often depends on the availability of the item. A large vessel called Uruli made of panchaloham – five metals - or normal Uruli or clean tray. The Ashtamangalyam is common in the arrangement of Vishukani in various regions. Next most important item on the list is the Kanikonna, a yellow color flower found throughout Kerala during the Vishu season. Most people are ready to give a miss to most items in the long Vishukani list but not the Kanikonna. It is a must for all people. Those people who do not have an uruli usually use any clean tray. The auspicious items are kept in front of an idol of Lord Krishna. The items are either placed in an uruli or sliver plate. Items that don’t fit into the tray or uruli are placed nearby. Traditional Kerala lamp – Nila Vilakku – is lit. In some places the traditional Kerala mundu is made into a fan shape and is inserted in the Kindi. The mirror is also inserted in it. The Vishukani is arranged on the previous night. Usually the eldest female member in the family sleeps in the room in which the Vishukani is prepared. She wakes up early in the morning and lights the lamp (between 4 am and 6 am). She then closes the eyes of each person in the family and guides each person to the Vishukani. After the Vishukani, the eldest member in the family distributes the Vishukaineetam – a coin.